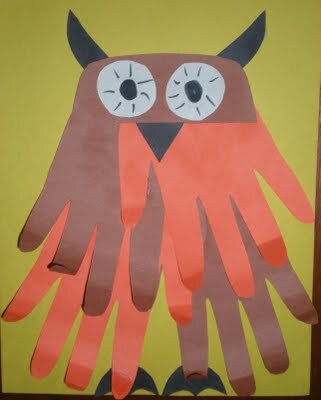 I never get tired of handprint crafts! I always loved making them and I cannot wait to receive them in a few years when my children start preschool. This particular project only uses paper. If you want, you could turn this into a mixed media craft to make it a little more interesting. I would suggest using pipe cleaner to make the beak and feet. You could also substitute googly eyes in place of the paper eyes. To add a little more color, scrapbook paper with a fall-colored pattern could be used in place of the construction paper.